When the chamomile are blooming in great profusion they look like miniature daises during the day and they fold their blossoms during the night. The blossoms have the wonderful smell of warm apple pie and Jenna rarely passes an opportunity to pick a blossom and tickle her nose Some european gardeners plant low growing varieties in the paths of their gardens to flavor the air with their fragrant aroma. When she was three, Jenna observed the behavior of the chamomile blossoms (or Corolla, Greek for "to fan out") folding up when the sun starts to wane for the day. She asked me if the flowers were hiding and I told her the petals were folding up. She thought about it for a minute and then said, "DaDa are they folding their hands to pray"? After reflecting on that, I think she was on to something. From great to small all of creation acknowledges the creator, especially the chamomile. 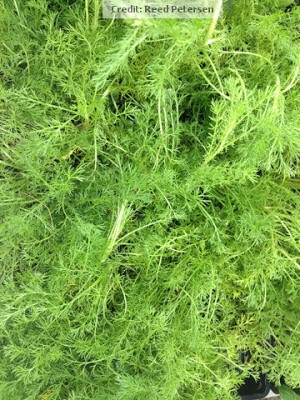 Chamomile is a great herb for making a relaxing tea in the evening. Now that she is older Jenna makes some very creative herbal teas using herbs like mint, rosemary, sage, cinnemon basil, and oregano.